I really wasn’t expecting to get to a game tonight, because as the afternoon wore on, games were being called off left right and centre. 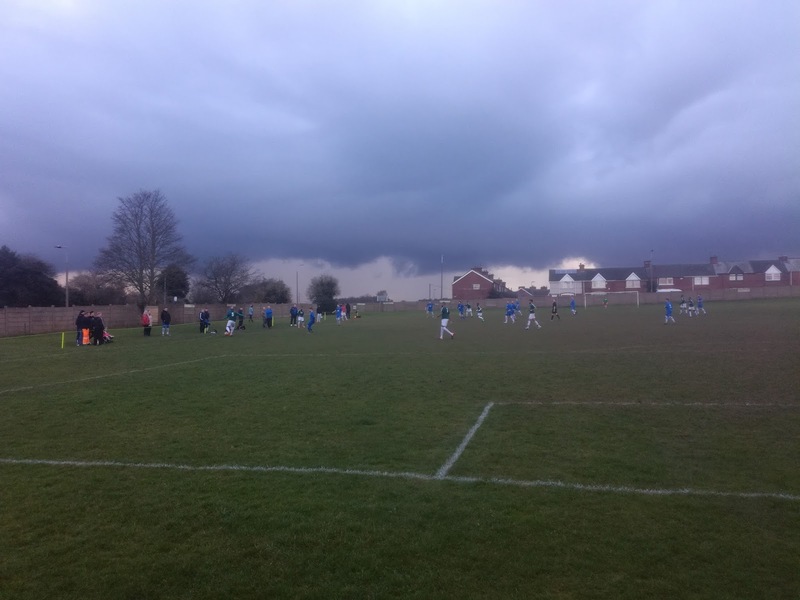 When I looked at 4.30pm I effectively had two choices, the Central Midlands League Cup Semi-Final at Clipstone, or, Loughborough University. 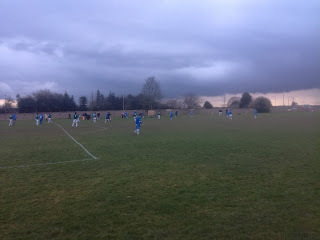 It turned out that the heavy rain that landed around 6.30pm caused late postponements in both cases anyway. I had all along intended on going across to Maltby to watch the game between Manor Hotel and Burngreave that was scheduled to be played on the outside pitches at Muglet Lane. But, I never really gave it a prayer of being on, until I sent a speculative tweet to the visitors to enquire about the game, and the very swift response confirmed that on the basis they hadn’t heard to the contrary, the game was on! 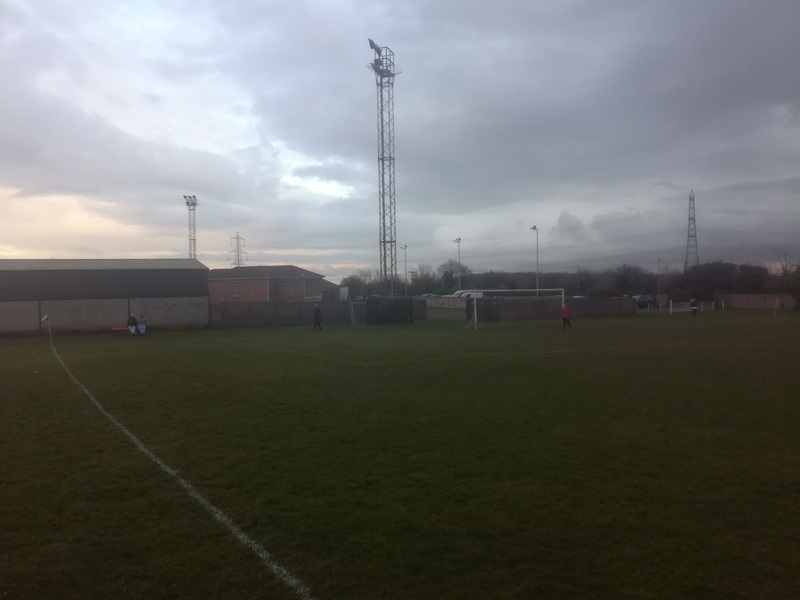 It didn’t take long to get to Maltby, and arriving around 45 minutes before the scheduled kick off it was clear to see that there was no problem. 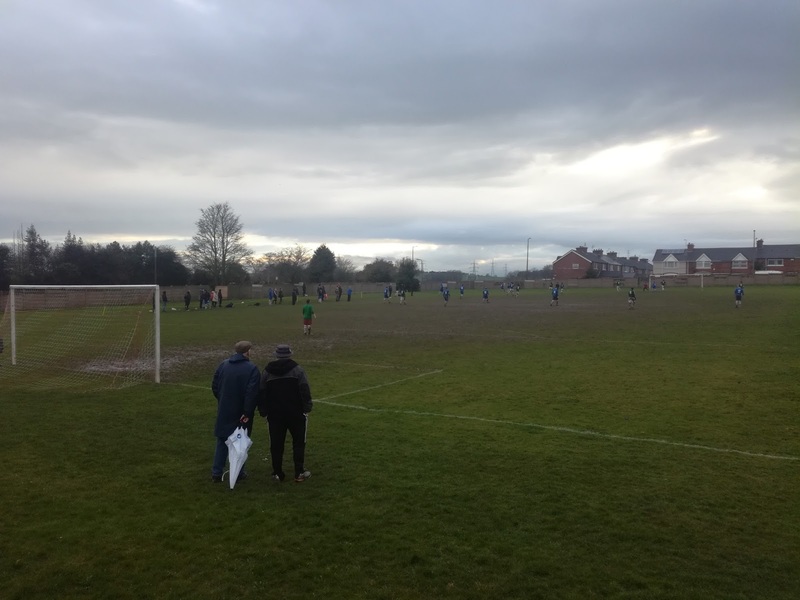 The pitch was soft, but not waterlogged, and with both teams and a referee in place, it was time to visit one of my all-time favourite haunts, the Maltby Miners Welfare. Suitably sustained, on arrival at pitch side it also became clear that we were going to have the highly unusual sight of a scheduled 6pm kick off happening bang on time. More often than not 6pm ends up being fifteen or twenty minutes later as the stragglers turn up, but not tonight, well done everyone. Burngreave have been going very well this season, and sat top of the league, while the hosts were nicely placed in third position. I would expect given the way the County Senior works, both will end up getting promoted, but in any case, it had the makings of a decent game, and one that could easily have a bit of edge to it, and so it turned out! Within fifteen minutes of the game starting, the rains came, and they came a bit more, and they continued to keep coming until about ten minutes before the end. 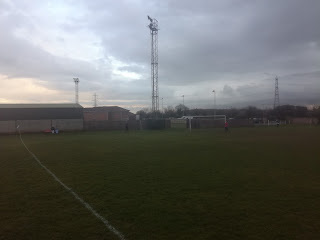 With no umbrella and no cover, I had to be innovative, and that meant walking into Maltby Main’s ground, climbing up onto the wall that sits at the edge of the covered Kop, and then shuffling along to the back wall of the stand, gripping the barrier, and peering round the corner to get a view of the action. To be fair, it wasn’t the most comfortable vantage point, but it did keep me dry. More on the game in a moment, but as we moved into the second period the pitch was getting decidedly messy. 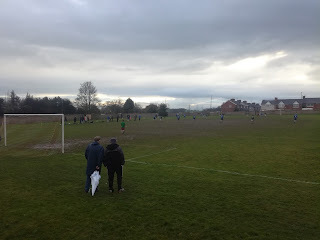 The middle area was starting to become something resembling a swamp, and players simply couldn’t keep their feet on it. That said, the rest of the pitch was fine, no puddles were forming, and in fairness to the referee, he adopted the stance of having started the game, he was going to finish it. Whether anyone can play on it again this season though is perhaps somewhat debateable. As for the game, it was very entertaining indeed. Burngreave have got some very skilful players, and on their home artificial pitch they play some fantastic football, but on tonight’s surface that wasn’t going to be quite so easy. Manor on the other hand can play football, but they also like to put a tackle in, and are more than adept at mixing it if required. Against Burngreave, the approach appeared to be to get in their faces at every opportunity, and not give them time on the ball. Burngreave took the lead mid-way through the first half via a goal that did have a suspicion of offside about it, this seemed to rile Manor and in amongst the ‘dark arts’ that they seemed happy to employ, they did identify that the visitors goalkeeper wasn’t the biggest and neither was he the most confident. An equaliser came just before half time, and was probably deserved on balance of play. The hosts started the second half with the momentum that came from the equalising goal, but Burngreave held firm and started to look threatening on the break. With the pitch worsening all the time, from two of those breaks it was the visitors who exploited their pace and numbers to score twice, sealing a vitally important win and three extremely hard earned points. But, the entertainment didn’t end there. With seven minutes to go a late tackle went in somewhere in the quagmire, and as the referee moved in to sort it, an altercation took place between two players away from the incident. Within seconds it kicked off and before you had chance to blink, all of the players, management, substitutes, some spectators and a couple of women had joined in the melee. It was hard to pick out who had done what to whom, but I did see a Burngreave substitute launch something that resembled a martial arts move on an opponent, while what appeared to be a supporter finished up flat on his back on the touchline with numerous people around him showing concern. Quite how he ended up prostrate I don’t know, but he seemed to come round and was helped back to his feet appearing to be none the worse for the incident. When it did finally calm down, a Manor player got a yellow, and the Burngreave sub got a straight red. To be fair, it was one of those where you could have dished out as many cards as you liked, but where do you stop it? At one point I did wonder if the referee might choose to abandon the game, and a weaker one could easily have done, but in fairness to him he let the players sort it out amongst themselves and then dealt with the disciplinary side. In fairness to both sets of players, it was handshakes all round at the final whistle, and no sign of any afters, but that aside, you have to credit both sides for putting on a great game of football under the circumstances of the conditions. The mark of champions if you ask me!